President Emmerson Mnangagwa greets David Parirenyatwa and Cleveria Chizema on arrival at a Politburo meeting in Harare on October 25, 2018. 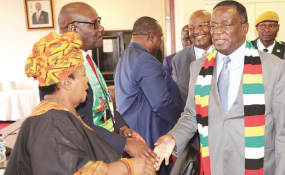 Zanu-PF has no plans for a Government of National Unity (GNU) with the opposition and is focused on implementing policies beneficial to Zimbabweans, the President has said. MDC-Alliance leader Mr Nelson Chamisa has been clamouring for a GNU since he lost the July 30 harmonised elections. President Mnangagwa dismissed as dreamers those thinking of a GNU, saying zanu-pf had no time for such people. He made the remarks while addressing the ruling party's Central Committee. "May I warn you not to take heed of utterances from various opposition quarters," said President Mnangagwa, to wild applause. "Let us focus our energies towards growing the economy. Let those who engage in dreams continue to dream and you must continue to be practical and move forward in the development of our country. "We have no agenda, nothing is on our agenda about Government of National Unity. Hatina agenda iyoyo. Mr Chamisa has of late been pushing for what he terms "a transitional Government". He lost to President Mnangagwa and zanu-pf in the July 30 harmonised elections and is still to come to terms with the defeat after raising false hopes among his supporters that he was winning. This week, Mr Chamisa convened a Press conference at Harvest House where he pleaded for a coalition Government with President Mnangagwa. "In fact, we will ultimately discuss and resolve our national issues as a country, but there has been no appetite from Mr Mnangagwa to discuss," Mr Chamisa told reporters during the Press conference. "He seems to want to discuss with the international community, not realising that the local community is more important to discuss with, as much as international community is also important." President Mnangagwa emphasised the need for discipline in zanu-pf. "I exhort party members to desist from indulging in showcasing utterances which prop up personal glory or image," he said. "Let us be wary of putting the party into disrepute or discord. We should have one mouthpiece of the party and one mouthpiece of the Government. "You find Cdes pronouncing issues of policies which even me as the President is not aware of. It is not acceptable. Let us keep our mandates. If you keep your mandate, unogara, ugogara uyinechigaro chako." President Mnangagwa said there was no room for fence-sitters in Zanu-PF. "In the wake of the extremely wicked activities by gluttonous persons and businesses in our economy, I challenge you as the party to be highly disciplined and upright in all your dealings," he said. "Shun all forms of corruption and be exemplary. Political positions should never be a licence to loot or abuse the offices you hold." President Mnangagwa said he deployed senior Zanu-PF members as full time employees to strengthen the party. Those deployed to the party include Dr Obert Mpofu, (Secretary for Administration), Cdes Patrick Chinamasa (Secretary for Finance), Simbarashe Mumbengegwi (Secretary for External Affairs), Munyaradzi Mangwana (Secretary for Legal Affairs), Lewis Matutu (Deputy Secretary for Youth Affairs), Josaya Hungwe (Secretary for Labour), Douglas Mahiya (Deputy Secretary for War Veterans), Cleveria Chizema (Secretary for Health) and Dr David Parirenyatwa (Deputy Secretary for Health).